Behind My Garden Gate Calendar 2016. I post a photo of a flower almost every day on my Facebook page, and I've chosen 12 special ones for this year's wall calendar. The 2016 calendar is filled with roses and lots of other flowers. All proceeds (not just profits) from the Calendar go to Northern California Golden Retriever Rescue. NCGRR oversees the Rescued Love from Taiwan program. I found Rosie, my golden retriever, through that wonderful program. So the production of the Calendar is my way of giving back and supporting this great organization. 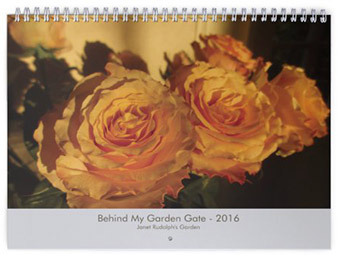 If you'd like to order a Behind My Garden Gate Calendar for 2016, here's the link. How wonderful. All of our Goldens came from a rescue organization and we've been a foster family for the organization as well. Such a wonderful breed and the dogs are so loving. They definitely deserved forever homes!